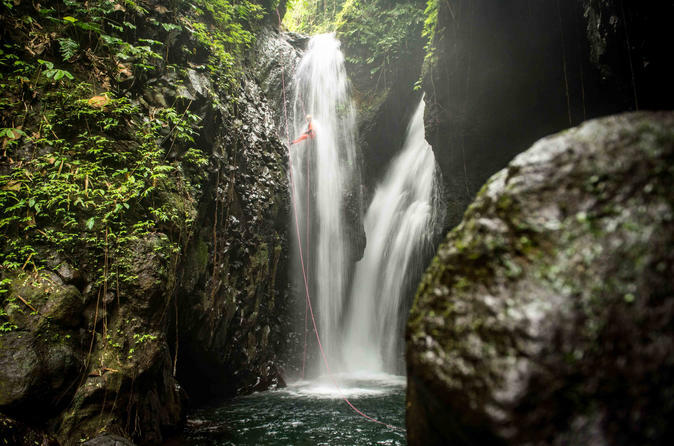 Kerenkali is the most popular trip in Bali, and it's easy to see why: the 'playground' section offers fun slides and nice jumps (some of which can be done multiple times), leading to 2 beautiful and challenging waterfalls in which you will learn and experience the essence of canyoning. The ability to swim is desired but not a requirement. To begin this day full of excitement, you will be picked up from your Bali hotel. After around 1.5hrs drive from your hotel to our base camp, you will get a light breakfast and an Introduction to the ICOpro Canyoneer initiation course to allow you to be autonomous during the trip. After a 10min drive with a pickup and 10min walking down in Bali jungle to reach the start point of Kalimudah canyon. Approximately 2.5hrs canyon with 9 rappels up to 26m, 4 jumps (Optional) up to 8m, 2 slides (optional) up to 4 m, swim up to 20m. You will reach the end point of the canyon with 15m rappel and take a rest in a natural hot spring. To return to your transfer, you will enjoy another 10mni hiking to reach the pickup and back to the base camp. Shower, lunch, and you will receive your ICOpro (International Canyoning Organization for Professionals) Canyoneer initiation certificate (ICOpro card) and your photo for free (Bring with you an USB flashdisk or eternal hard disk). Sit back and relax in our air-con transfer back to your hotel.